Development :: Precious Smile Dental Cosmetic Centre :: Surat :: Gujarat :: India. Humans have two sets of teeth. The teeth that appear first are called the milk teeth or deciduous dentition or the primary teeth. These teeth are later shed off and are replaced by permanent set of teeth called the permanent dentition. What age do the teeth start appearing? The diagram on the right gives the usual order of appearance of the milk teeth. However the order may differ in some children. The milk teeth start appearing at 6 months of age. It is quite normal for them to erupt a few months earlier or later. The first milk teeth to appear is the lower front tooth called the lower central incisor. 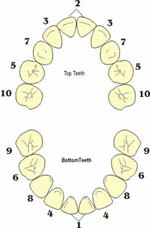 However the order of eruption of different teeth may vary in some children. Is it normal for the teeth to erupt late? It is quite normal for the teeth to erupt 3-6 months later than the expected time. However delay beyond 6 months may be an indication that you should consult your dentist. The dentist would try and determine the cause of the delay. Very rarely we come across babies who are born with one or more teeth. Teeth that are seen at birth are called natal teeth while teeth that appear within a month of birth are called neonatal teeth. These teeth are retained unless they are very mobile or pose major problems in nursing. At what age do the permanent teeth start appearing? 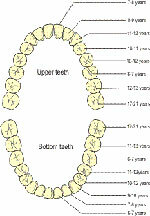 The permanent teeth start erupting by about 6 years of age. Most of the permanent teeth erupt by 12 years of age except the third molars or the wisdom teeth, which erupt any time between 18 -25 years of age. Teething is a phase in early childhood during which the milk teeth emerge into the mouth cutting through the gums. Children experience discomfort during this phase and may have disturbed sleep, eating problems and may be restless and cranky. Do children fall sick during teething? Teething is often blamed for systemic conditions like diarrhea, vomiting and fever. The possible explanation for this is that during teething the child has a tendency to chew objects for relief, which at times may not be clean and may be a source of microbes. How to cope with teething? The discomfort associated with teething can be relieved to a certain extent by using teething gels, which are basically anti-inflammatory analgesics. These gels are massaged over the gums. Teethers of different types are available which the child can chew on for relief. The cutting edge of the newly emerged front permanent teeth (incisors) are not even. They show elevations called mammelons that correspond to their developmental lobes. These in due course wear off to form a flat cutting edge. Is it normal to have extra teeth? Sometimes we do come across children who have an extra tooth or teeth. These are called supernumerary teeth. These extra teeth may appear as normal looking teeth or may be odd shaped. An example of extra teeth is a mesiodens that may occur as a cone shaped tooth in the midline between the two upper incisors. The presence of extra teeth cannot be considered normal as they upset the normal dental balance. Thus they may have to be extracted followed by orthodontic treatment. Missing teeth are also common. The tooth that is most frequently missing is the upper lateral incisor. The wisdom tooth may also be frequently missing. Missing teeth pose the problem of spacing between teeth. Is it normal to have teeth of different sizes and shapes? Teeth vary slightly from person to person in their shape and size. However it not uncommon to find teeth that are odd shaped or sized. Some of these teeth may be reshaped by the dentist to resemble normal teeth. Some may require a crown over them to make them look more normal. How do we clean infant's teeth? Infant's teeth can be cleaned with a soft cloth wrapped around the index finger. Wet the cloth and rub gently over the teeth to clean them. Small soft brushes that can be inserted over your fingers are available that can be used to clean the teeth. At what age do we start using the toothbrush? You can introduce a baby- size tooth brush at around 12 months of age encouraging the child to use the brush himself. Though the child may play with it rather than brush his teeth,it will ensure good lifelong,habits in your child.This should be followed by the parent properly brushing the child's teeth for him. What types of pastes are best for infants? Initially for a toddler,a wetted toothbrush is sufficicient to brush the teeth. Once the child has learnt to rinse his mouth and spit, you can start using a pea-sized helping of fluoride toothpaste. Most dentists advise using fluoride tooth pastes around three years of age. If you think your child may swallow the toothpaste, you can use a non-Fluorideted one till he learns to spit it out. How many times should the child brush his teeth? It is a good habit to brush the teeth both mornings soon after getting up and just before going to bed at night. Children should also be told to gargle every time after something is eaten. Why do we use Fluorideted toothpastes?